As Russia prepares for a major reform of its law enforcement, Moscow's policemen just try to do their jobs. Sergeant Mikhail Menshenin is trying to hush a screaming 86-year-old retiree while parrying her flailing swings. Menshenin and his partner were called to the woman’s apartment by a social worker, Lyudmila, who said the pensioner attacked her. “She’s gone completely mad,” Lyudmila said between sobs. Back in the patrol car, calm restored, Menshenin was thankful the woman didn’t have her cane. “They’re lethal with those things,” he said. Police officers Alexander Kuzminov, 23, and Menshenin, 25, patrol a district in southwestern Moscow. 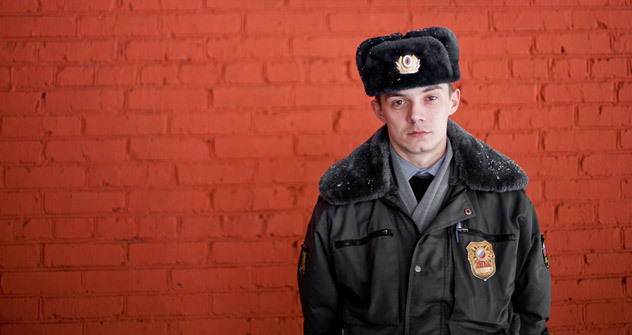 They speak proudly of their devotion to duty, but as officers in Moscow’s militsiya, as the police are called in Russia, they are members of an institution that is widely derided as hopelessly corrupt. Menshenin earns about 25,000 rubles a month, or approximately $850, which is a penurious sum of money in one of the most expensive cities in the world, and all the more so for a married man with a two-year-old son. The low pay and lack of benefits pushes many officers into accepting bribes, and corruption has significantly tainted the reputation of the police. In the latest survey by Levada, an independent polling organization, 60 percent of Russians said they were dissatisfied with the performance of the police, and only 10 percent fully trusted the force. It is the routine solicitation of small bribes, often after they are stopped for minor traffic infractions, that has so soured Russians on their police. A 2009 supermarket shooting spree by Police Major Denis Yevsyukov, which grabbed national headlines, prompted President Dmitry Medvedev to call for an overhaul of the police. Staff cuts and pay raises were announced, while a new law on police was posted online for public discussion. To build trust, Medvedev suggested reverting to the tsarist-era “police” name rather than the current “militsiya,” or “people’s militia,” a relic of Soviet times. The final law incorporated those changes as well as some suggestions posted online by ordinary people. An officer’s authority will now be limited to his precinct, people will be given the right to make a free phone call after they are arrested, and Russians will now enjoy their own equivalent of Miranda rights. Medvedev also proposed significant pay raises to reduce the incentive to take bribes. The bill is set to come into force on March 1st. Some lawmakers, however, are skeptical that the bill will curtail corruption or ease popular discontent with the police. “Instead of a new force, we get the same militsiya with a new name,” said Gennady Gudkov, deputy Chairman of the Security Committee in the Duma, the lower house of parliament, and a member of A Just Russia, an opposition party, told Russia Now. Some senior police officials are also skeptical that the reform will usher in a new era, and said there needs to be a broad attack on corruption, targeting both state institutions and public attitudes. “If we don’t reform other institutions along with the police and clarify who’s responsible for what, no staff cuts or increases will make any difference,” said Police Chief Yury Matyukhin of Moscow’s Southwest District. “In my personal experience, there was nothing particularly bad about the police,” said Petrov. Indeed, Matyukhin said few institutions have attempted to combat internal corruption as aggressively as the police. “I challenge you to show any government body in Russia that is doing more to transparently fight corruption and purge its own ranks than the militsiya is already doing,” said Matyukhin. But Petrov said the militsiya cannot police itself and still expect to restore public confidence.